Why Choose Patent Innovations LLC? - Why Choose Patent Innovations LLC? The practice of patent law is by its very nature in a state of perpetual change. In order to remain well qualified to practice, a patent agent or patent attorney must constantly stay abreast of additions and revisions to the federal patent statutes, the rules of practice in the United States Patent and Trademark Office, and current patent related federal court decisions that define new case law. When selecting a patent agent or patent attorney, a client should seek an individual who proactively pursues continuing education opportunities in order to stay current in this dynamic field. There is another aspect of the change that has occurred in patent practice, and it relates to the recent rapid advances and assimilation of software tools and information technology. These advances have made it possible for clients and their patent agents or patent attorneys to communicate more efficiently than ever before, and for the entire patent application preparation process to be simplified and compressed. They are essential elements in a contemporary patent practice. When you are evaluating a patent agent or patent attorney as a candidate to handle your patent matters, you should determine if the patent agent or patent attorney is proficient in the use of the most current patent application preparation tools. Don’t hesitate to ask the agent or attorney if he or she has at least basic proficiency in the use of the latest modeling software tools to facilitate and accelerate the process of preparing a patent application. New software tools have enabled integration of product engineering, design, and prototyping activities with patent application preparation. The results are better quality patent applications in less time at lower cost. As an example, refer to the images to the right. The upper image is from the 3D model of the ProVore® grinder pump by Liberty Pumps of Bergen NY. The middle image is FIG. 3 from U.S. Patent 9,719,515. 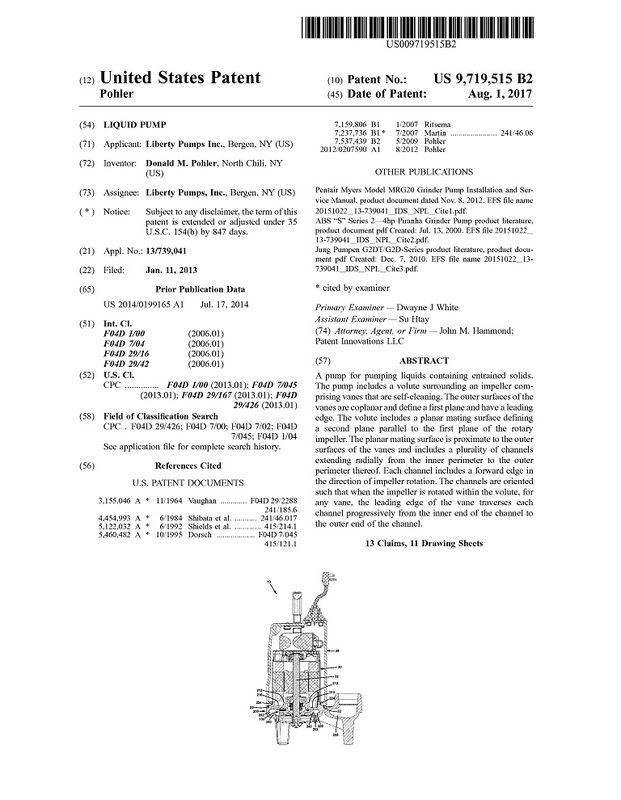 All of the drawings in this patent were prepared from images extracted directly from the model file – in a fraction of the time that typical patent drawings take to prepare. Quality. Speed. Low cost. I developed these techniques and have been using them efficiently for many years. This website is provided to convey general information about Patent Innovations LLC (“PILLC”), as well as general information regarding patents. While efforts are made to maintain and update the information provided on this website, it is not promised or guaranteed to be current, correct, or complete. The information provided on this site should not be construed as legal advice on patents or any other subject matter. Certain links provided in this website lead to other websites. PILLC does not necessarily control, endorse, or approve of the information provided on these sites. The links are provided only as a convenience to users of this site. This website does not constitute an offer of representation, and its use is not intended to create an agent-client relationship. Communication by anyone via the “Request Information” page of this website, or via direct e-mail does not establish an agent-client relationship with PILLC. The confidentiality of communications made via this website or unsolicited e-mail communications sent to PILLC cannot be guaranteed. Therefore, neither this website nor any other e-mail correspondence should be used to send any confidential information to PILLC until authorization is obtained from us. In the event that an immediate response to an inquiry is required, site users must contact PILLC by telephone rather than e-mail. All content on this site is under copyright by Patent Innovations LLC. All rights reserved. Use of the contents of this site other than for personal use is prohibited.